This article is about Roland Emmerich's 2008 film. For the millennium, see 10th millennium BC. 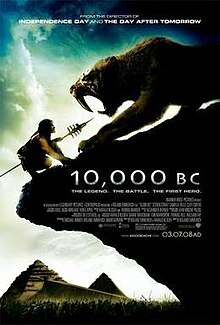 10,000 BC is a 2008 American epic adventure film from Warner Bros. set in the prehistoric era, about the journeys of a prehistoric tribe of mammoth hunters. It was directed by Roland Emmerich and stars Steven Strait and Camilla Belle. The world premiere was held on February 10, 2008 at Sony Center on Potsdamer Platz in Berlin. Emmerich's film was a box office hit, but consistently regarded by professional critics as his worst film, as well as one of the worst films of the year. At about 10,000 BC, a tribe of hunter-gatherers called the Yagahl live in a remote mountain range in the Urals and survive by hunting woolly mammoths for food. The camp is led by a hunter who has proven his bravery by killing a mammoth single-handedly, and taking the White Spear. The people also strongly venerate an elderly neanderthal woman, the last of her kind, called Old Mother, who has shamanistic powers. As time goes by, the mammoths that supply the people start to dwindle, and the chief of the tribe finds a young girl with blue eyes named Evolet who survived a massacre of her village, perpetrated by what Old Mother calls "four-legged demons" who will come when "the Yagahl go on their last hunt". Her prophecy also states that whomever kills the leader of the “four-legged demons” single-handledly will win both Evolet and the White Spear. As such, that individual will become the next village leader. The people believe that the “four-legged demons” are referring to mammoths; therefore they believe the return of the mammoths will happen at that time. The new leader will be saving them all from starvation. Unfortunately, the current chief of the village does not believe in Old Mother's prophecy, and is desperate to feed his people. He believes they cannot continue to wait for the prophesied “last hunt”, and leaves his people on a quest to find where the mammoths have disappeared. He gives the White Spear to his friend Tic'Tic, who also watches over D'Leh, the chief's son. As Tic'Tic alone is entrusted to know of the quest, all the others in the tribe including D'Leh's rival, Ka'Ren, believe that D'Leh's father was a coward and fled. Over time, D'Leh and Evolet fall in love and become close. When the mammoths finally come, D'Leh and the other men of the tribe hunt them under Tic'Tic's leadership, and D'Leh manages to kill one of them by causing the animal into skewering itself on his spear, inadvertently winning the White Spear. He also wins Evolet in marriage. Everyone believes that all that has happened is old Mother’s prophecy playing itself out; however, D’Leh is consumed by the guilt that he did not earn the White Spear fairly. After speaking with Tic'Tic, he gives up the White Spear and by effect, forfeits his marriage to Evolet. The next day, horse-raiders attack the camp, enslaving Evolet and several others and killing many of the tribe. D'Leh, Tic'Tic, Ka'Ren and the young boy Baku set out to rescue Evolet and their fellow Yagahl, but she is recaptured with Ka'Ren and Baku during an attack on the slavers by terror Birds. Tic'Tic is wounded by the predators during the battle. D'Leh and the injured Tic'Tic continue on. When D'Leh is out hunting, he falls into a pit. When he wakes from the fall, he suddenly finds and rescues a smilodon trapped in the pit under fallen debris and then escapes himself. After Tic'Tic recovers, they make their way to a village nearby and learn of a prophecy from the Naku, a tribe they meet: whoever talks to a Smilodon that they call the "Spear-Tooth" will help free their people. D'Leh realizes the prophecy is about him when the same Smilodon that he rescued arrives, but instead refuses to kill D'Leh as it recognized him before leaving. The group also learn that D'Leh's father, the chief of the Yagahl, was a guest of the Naku and learned from them until the slavers took him captive and Tic'Tic finally reveals to D'Leh why his father left. Several tribes agree to form a coalition to pursue the raiders that stole their families with D'Leh as their leader. They soon find the ships holding Evolet and their companions. However, with no means to follow the ships, they journey through a vast desert, eventually discovering an advanced civilization similar to ancient Egypt, ruled by an enigmatic figure known as "The Almighty". In this civilization Evolet, Baku and the other kidnapped Yagahl are forced to work as slaves. There, the warlord who kidnapped Evolet tries to coerce her into loving him, only to be arrested by The Almighty when they find he has taken her without permission. During a night scouting raid, D'Leh learns of the Almighty and the fate of his father, who perished as a slave. However, the guards see them and attempt to warn the Almighty. Tic'Tic dies from injuries sustained in the fight that follows with the guards, though not before killing them before they can raise the alarm. The Almighty's priests also meanwhile come to believe that Evolet is destined to kill The Almighty, based on the whip scars on her hands matching the stars they call the "Mark of the Hunter" and an ancient prophecy foreseeing their civilization's downfall. The Almighty realizes that Evolet is not the focus of the prophecy, but the hunter's (D'Leh's) herald. D'Leh then starts a rebellion among the slaves, killing many of the Almighty's forces, though Ka'Ren is killed. The Almighty offers Evolet and the other hunters to D'Leh in exchange for abandoning his rebellion. D'Leh feigns acceptance of the deal but throws a spear at The Almighty and kills him. During the ensuing battle, Evolet dies at the hands of the Warlord before he in turn is killed by D'Leh, but is restored to life by the Old Mother sacrificing her own life with her powers. With the Almighty and his people dead and his civilization destroyed, the Yagahl bid farewell to the other tribes and return home with seeds given to them by the Naku people to begin farming and start a new life. Steven Strait as D'Leh, a mammoth hunter. Camilla Belle as Evolet, D'Leh's wife and the only survivor of a tribe which was killed off by the "four-legged demons" (fierce warriors on horseback). She is unique as she has blue eyes. Cliff Curtis as Tic'Tic, D'Leh's mentor and friend. Joel Virgel as Nakudu, leader of the Naku tribe. Affif Ben Badra as Warlord, leader of the "Four Legged Demons." Marco Khan as One-Eye, Warlord's main henchman. Mona Hammond as Old Mother, the Yagahl wise old woman. Junior Oliphant as Tudu, Nakudu's son. Kristian Beazley as D'Leh's father, who had lived with the Naku tribe and learned agriculture from them. Boubacar Badaine as Quina, leader of another tribe. Tim Barlow as The Almighty, a tall, blue-eyed man who dresses in long white robes and a face-concealing veil. He is the last of three kings, and the last of the Atlanteans. The mammoths in the movie were based on elephants and fossils of mammoths, while the saber-toothed cat was based on tigers and ligers (a lion/tiger hybrid). The sounds made by the saber-toothed cat in the movie are based on the vocalization of tigers and lions. Emmerich opened casting sessions in late October 2005. In February 2006, Camilla Belle and Steven Strait were announced to star in the film, with Strait as the mammoth hunter and Belle as his love. Emmerich decided that casting well known actors would distract from the realistic feel of the prehistoric setting. "If like, Jake Gyllenhaal turned up in a movie like this, everybody would be, 'What's that? '", he explained. The casting of unknown actors also helped keep the film's budget down. At the 2008 Wondercon, Emmerich mentioned the fiction of Robert E. Howard as a primary influence for the film's setting, as well as his love for the film Quest for Fire and the book Fingerprints of the Gods. Director Roland Emmerich and composer Harald Kloser originally penned a script for 10,000 BC. When the project received the greenlight from Columbia Pictures, screenwriter John Orloff began work on a new draft of the original script. Columbia Pictures, under Sony Pictures Entertainment, dropped the project due to a busy release calendar, and Warner Bros. picked up the project in Sony's vacancy. The script went through a second revision with Matthew Sand and a final revision with Robert Rodat. Production began in early 2006 in South Africa and Namibia. Location filming also took place in southern New Zealand and Thailand. Before shooting began, the production had spent eighteen months on research and development for the computer-generated imagery. Two companies recreated prehistoric animals. To cut time (it was taking sixteen hours to render a single frame) 50% of the CGI models' fur was removed, as "it turned out half the fur looked the same" to the director. Emmerich rejected making the film in an ancient language (similar to The Passion of the Christ or Apocalypto), deciding that it would not be as emotionally engaging. Dialect coach Brendan Gunn was hired by Emmerich and Kloser to create "a half dozen" languages for the film. Gunn has stated that he collaborated informally with film lead Steven Strait to improvise what the languages would sound like. In an alternative ending, the scene shifts forward many years into the future, showing Baku's retelling of the story by the camp fire. It ends with a child asking what had happened to the "Mountains of the Gods", and Baku responds, "They were taken back by the sands. Lost to time, lost to man". The film received largely negative reviews from critics, stating that the movie is mainly visual and lacks a firm screenplay. Critics noted that the film is archaeologically inaccurate and contains many factual errors and anachronisms. As of December 16, 2014[update], the review aggregator at Rotten Tomatoes has reported that 8% of critics gave the film positive reviews, based on 146 reviews. The site's consensus states: "With attention strictly paid to style instead of substance, or historical accuracy, 10,000 BC is a visually impressive but narratively flimsy epic." Metacritic reported the film had an average score of 34 out of 100, based on 29 reviews. Audiences surveyed by CinemaScore gave the film a grade C.
Todd McCarthy of Variety wrote: "Conventional where it should be bold and mild where it should be wild, "10,000 BC" reps a missed opportunity to present an imaginative vision of a prehistoric moment. "Peter Bradshaw of The Guardian wrote: Roland Emmerich's great big CGI blockbuster lumbers along like one of the woolly mammoths that roam across the screen. Composer Thomas Wander won a BMI Film Music Award for his work on the film. After the release of the film the name Evolet came into use as a given name. In the film, the name means "the promise of life" in the fictional language spoken by the Yaghal. A more recent variation, Evoleht, arises from spelling "the love" backwards. The name could also be a combination of the names "Eva" and "Violet", or derived from "evolution." The film was a moderate success at the box office. In its opening weekend, the film grossed $35.8 million in 3,410 theaters in the United States and Canada, ranking No. 1 at the box office, and grossing over $22 million more than the film in second place, College Road Trip. As of April 29, 2008[update], it has grossed approximately $268.6 million worldwide—$94.6 million in the United States and Canada and $174 million in other territories—including $17.2 million in Mexico, $13.1 million in Spain, $11.3 million in the United Kingdom, and $10.8 million in China. This also makes it the first film of 2008 to surpass the $200 million mark. The DVD of the film was released on June 24, 2008 in single-disc editions of DVD and Blu-ray Disc in the United States. Best Buy released a 2-disc limited edition along with the DVD and Blu-ray Disc releases. It was released on July 21, 2008 in the United Kingdom. The film grossed $31,341,721 in DVD sales, bringing its total film gross to $300,414,491. ^ Welt Online (February 26, 2008). "Emmerich feiert Start seines Steinzeit-Films (German)". Die Welt. Retrieved March 11, 2008. ^ Hilary Whiteman (March 3, 2008). "10,000 BC: The premiere (English)". CNN. Archived from the original on March 7, 2008. Retrieved March 11, 2008. ^ "Tomato Picker 2008 films with <10% "fresh" ratings". Rotten Tomatoes. Retrieved March 16, 2009. ^ Shawn Adler (June 29, 2007). "Emmerich Heads Back In Time For '10000 B.C.'". MTV. Archived from the original on July 2, 2007. Retrieved July 11, 2007. ^ "Introduction to Inside "10,000 BC" - HowStuffWorks". HowStuffWorks. Retrieved February 27, 2015. ^ "10,000 B.C. – Exclusive Interview with Supervising Sound Editors Simon Gershon and Jeremy Price". Retrieved February 27, 2015. ^ Michael Fleming (October 5, 2005). "Sci-fi guy follows primal instinct". Variety. Retrieved August 20, 2006. ^ a b c Borys Kit (February 27, 2006). "Strait, Belle fight for mankind". The Hollywood Reporter. Archived from the original on March 13, 2006. Retrieved August 20, 2006. ^ a b Adam Smith (January 2008). "News Etc". Empire. p. 16. ^ "WonderCon 2008: Day 2 - Part 1! - ComingSoon.net". ComingSoon.net. Retrieved February 27, 2015. ^ Pamela McClintock (January 30, 2006). "Warners goes on time trek". Variety. Archived from the original on November 26, 2010. Retrieved August 20, 2006. ^ "Principal Photography Commences on the Epic Adventure 10,000 B.C, Directed by Roland Emmerich for Warner Bros. Pictures". Business Wire. May 9, 2006. Retrieved February 2, 2017. ^ "Exclusive CS Featurette: 10,000 BC". ComingSoon.net. March 5, 2008. Archived from the original on September 9, 2009. Retrieved March 5, 2008. ^ "Steven – Online II Press Archive". steven-online.org. Archived from the original on January 21, 2010. Retrieved February 2, 2010. ^ Gunn, Brendan (January 13, 2008). "How I told Brad Pitt to mind his language – Telegraph". The Daily Telegraph. London. Retrieved February 2, 2010. ^ White, Caroline (4 August 2009). "The 10 most historically inaccurate movies". London: The Times. Archived from the original on 15 June 2011. Retrieved 2009-08-05. ^ "10,000 B.C." Rotten Tomatoes. Retrieved March 7, 2008. ^ "10,000 B.C. (2008)". Metacritic. Archived from the original on March 6, 2008. Retrieved March 7, 2008. ^ "10,000 B.C. (2008) – Weekend Box Office Results". Box Office Mojo. Retrieved March 16, 2008. ^ "'10,000 B.C.' roars to top of box office". CNN. Archived from the original on June 5, 2008. Retrieved March 9, 2008. ^ "10,000 B.C. (2008)". Box Office Mojo. Retrieved April 6, 2008. ^ "10,000 B.C. (2008) – International Box Office Results". Box Office Mojo. Retrieved March 30, 2008. ^ "Rakuten - A new way to earn Super Points". Play.com. Retrieved 2017-01-11. ^ "10,000 B.C." Retrieved February 27, 2015.